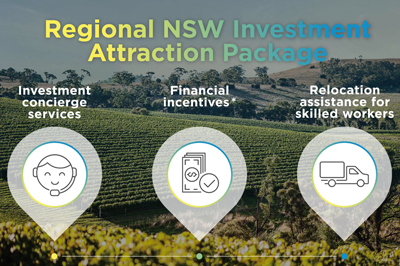 New South Wales (NSW) is home to a broad range of industry sectors such as food and beverages, aerospace, medical technology and creative industries. Many of the companies in these sectors are using state-of-the-art technology and highly skilled staff to manufacture their products. NSW has the largest number of manufacturing businesses of any state or territory in Australia. These businesses collectively generate $33 billion in industry valued-added* and employ more than 253,000 people in a range of industries, as summarised in the table below. In addition to the 253,000 people it directly employs, it is estimated manufacturing indirectly supports another 109,000 workers. They include farm workers, freight handlers and call centre staff as well as professional services providers such as patent lawyers, freelance designers and brand consultants, all selling goods and services to manufacturing companies in NSW. It is estimated that the NSW sector spends more than $4 billion annually on professional services, supporting around 16,000 jobs. *Industry gross value-added (IGVA) measures the value of goods produced in an industry. It is used to measure the contribution of individual industries to the gross product of a state or territory.